Zakat Foundation of America (ZF) Delaware Youth Group recently won two awards in the DelawareCAN competition held by the Food Bank of Delaware. Their entry was a masjid constructed entirely of non-perishable food in cans and boxes. In preparation for the group’s first time participating in the competition, which is in its third year, the 22 youth brought canned food each week to their math tutoring sessions at the ZF Delaware Community Center. They also collected $400 in donations from community members. The youth worked with community members to create the design that would ultimately win the “Best Use of Labels” and “People’s Choice” awards. 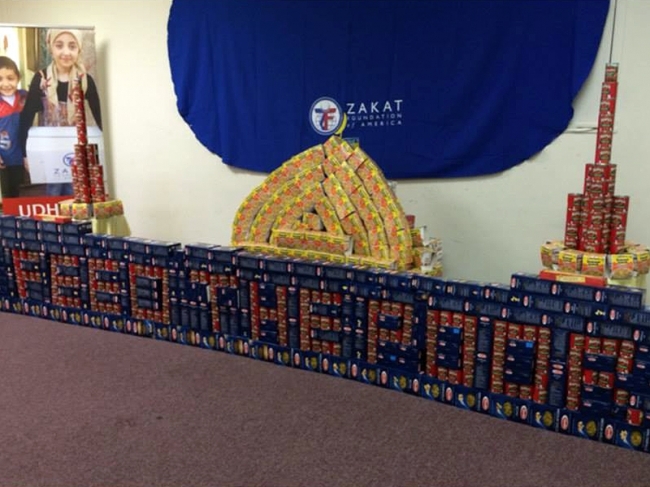 Their masjid incorporated the message “Feed the Poor” using ZF’s logo colors of red and blue. The youth used the donated money to purchase blue pasta boxes and red tomato pasta cans for the front panel and text. The dome was built from chicken soup boxes and the minarets from tomato paste cans stacked on two round tables. A crescent-shaped toy discovered in the Center’s toy box topped the dome. Organizations, schools and businesses created sculptures out of non-perishable food they collected from their communities for the competition, donating the sculptures to the Food Bank for distribution to needy families. The competition contributed a total of 46,000 pounds of nonperishable food from all entries.